We frequently view publishing as a binary: traditional publishing or self-publishing, which should I choose? In truth, there is a wide range of publishing options available to indie authors, each with advantages and disadvantages. Today, we’ll examine one of the newest of these publishing models: hybrid publishing. In hybrid publishing, the author pays the publisher a fee up front to offset the costs of production. Although this is frequently abused by exploitative companies, there are reputable hybrid publishers who offer sound value for the author’s investment. We’ve invited Brooke Warner to discuss the pros and cons of this rapidly expanding model. Brooke is chairperson of the Independent Book Publisher’s Association (IBPA) and co-founder and publisher of She Writes Press, a thriving hybrid publisher serving women authors. JOHN: Welcome, Brooke! Let’s get straight to the controversy. ALLi’s Watchdog Desk urges a skeptical and cautious approach when considering a hybrid publishing scenario. One of our chief concerns is the transfer of risk from the publisher to the author: when the publisher’s income is not dependent on the quality or success of the book, it’s possible for an unscrupulous or incompetent publisher to turn out an inferior product, then walk away with the author’s cash. How can authors differentiate a bad actor from a genuine publishing partnership? BROOKE: I appreciate ALLi’s concern in these cases, and it’s true that there are a lot of bad actors out there and that authors need to be proactive and ask the right questions. There are also many service providers masquerading as hybrid publishers because they think it sounds more appealing to call themselves a publisher when they’re not in fact offering the benefits and skills that a publisher would offer. Authors need to look at the services they’re getting when they sign up to publish their work, whether that’s with a service provider or a hybrid publisher. A service provider who’s transparent about what they offer isn’t doing anything wrong or unscrupulous just because they charge for their services, but it would be problematic for them to suggest they offer a “publishing partnership” if they’re only offering services. JOHN: From ALLi’s point of view, the cardinal rule of publishing is that money flows to the author. Unfortunately, that advice has become distorted into “never pay for publishing”, which is a gross oversimplification. Professional indie authors routinely pay for self-publishing services, and there’s nothing inherently wrong with doing so. It’s the quality of the work and the return on investment that authors need to be wary of. 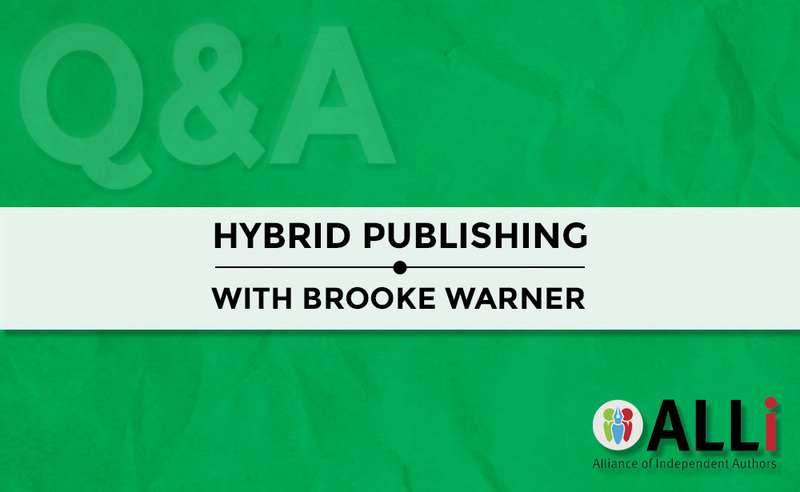 BROOKE: Hybrid publishers who actually qualify as hybrid publishers by the definition set forth in the Independent Book Publishers Association Hybrid Publisher Criteria, which I helped to define in early 2018, prove their investment in a number of ways. Though the business model is an author-subsidized one, hybrid publishers curate their publishing lists, have active distribution for their titles, and have proof that their model is working in the success of their backlist. I can only speak for my own presses, She Writes Press and SparkPress here, but I think other reputable hybrid publishers will agree when I say that we put our reputation and brand on the line when we publish. And while authors pay to publish with us, the partnership is in our standards, in the longevity of the working relationship, and in our championing of our titles to our sales force and to the industry at large. We are a publishing partner because we advocate for our authors and our titles. If an author has big financial success, they benefit from that windfall. We do make some profit, albeit nothing compared to a traditional publisher who shoulders the full cost of publishing, of course. But we see the flip side of your assertion about the transfer of risk to be true as well, which is that if the author carries the financial risk, they benefit from the financial success when the book performs well. As a hybrid publisher I have seen royalty statements that far exceed those from the small press I worked for before founding She Writes Press. The reason for this, of course, is that in our authors’ case, they’re keeping 60% of their print and 80% of their ebook sales. This is an entrepreneurial model, and while it’s not right for all authors, there is an opportunity for authors who partner with the right publisher—with a press that advocates for its books, that has inroads into marketplaces authors couldn’t reach on their own, and that has a strong reputation in the industry. If I were an author I wouldn’t settle for anything less than this—and aspiring authors should be able to have a conversation with the publisher or someone high up on the editorial team before signing a contract. They should not be negotiating or signing a contract with a sales person whose job it is to close contracts. That’s an indication that they’re working with a service provider, and not a publisher. JOHN: That’s sound advice. ALLi believes that the greater burden of risk shouldered by the author should be compensated, specifically with a greater share of the profits. Do you agree? BROOKE: Yes, I absolutely agree. This is why IBPA’s Hybrid Publisher Criteria stipulates that reputable hybrid presses will pay their authors a higher-than-standard royalty. The criteria states that the author’s share of the profits be laid out transparently and must be commensurate with the author’s investment. IBPA also states that the author’s royalty should be greater than 50% of net on both print and digital books. In the case of my two imprints, we chose higher royalties than 50% because the authors’ investment is high. I encourage authors to understand where the other percentage goes, too. In our case, our distributor takes a 30-35% commission on sales, so we’re passing back almost all of the profits to the authors. This is by design, and for us it doesn’t signify a lack of investment in the books’ success, but rather a desire to reward the author as much as possible, so that there is a greater incentive for the financial risk they inherently take when they publish with us. JOHN: I’ve expressed concern in past articles about the potential negatives of hybrid publishing, but what do you see as the positive aspects of this model? BROOKE: There are many positives, including professionalism, access, and legitimacy. I see hybrid publishing as an alternative to traditional publishing for those authors who either are getting shut out of the traditional publishing space because they don’t have a big enough brand or author platform, or for those authors who are disillusioned by traditional publishers (for reasons that include low royalties, lack of investment in their authors, getting dropped by a previous publisher, etc.). I believe self-publishing is a great alternative for some authors, but not for those who don’t want to learn the business. This is where professionalism comes in, because hybrid presses should be providing expertise in both editing and design, making sure their authors are publishing books that will compete with their traditional counterparts. The issue with self-published books is that the quality is hit or miss, and as long as amateur authors continue to publish without the support of publishing experts, we will continue to see a stigma against self-publishing in traditional publishing circles (which extends to trade magazines, bookstores, libraries, contests, associations, and beyond). JOHN: Very true! The days of homemade covers and slapdash editing are falling behind us; today’s market demands professional standards, and yet we see far too many publishers distributing books with these fatal flaws. Preserving the author’s artistic vision is important, but allowing substandard quality is a grave disservice that harms the reputation of the author, the publisher, and the indie author community as a whole. BROOKE: Yes, we’re on the same page there! What I’ve seen is that hybrid presses that have demonstrable successes are overcoming that stigma and making inroads for their authors into spaces where self-published authors are still barred. They also present opportunities to authors who are looking for more access into traditional marketplaces, like bookstores and libraries. Some hybrid presses also open doors for more and better publicity exposure if the press itself has established itself as a legitimate player in the publishing industry. All of these potential opportunities speak to the importance of finding the right hybrid publishing partner, because not all hybrid publishers have made these inroads, and authors would do well to flat-out ask all of these questions to the publisher they’re considering working with. JOHN: When do you feel an author should consider a hybrid publishing option as opposed to pure self-publishing, or purchasing a full-service publishing package from a reputable provider? Authors who want the legitimacy that comes from publishing on a reputable hybrid publisher. Because publishing with a hybrid press means authors publish under the press’s logo and ISBN, if the hybrid publisher has a good reputation, and is known in the industry by book publishing professionals, then the act of publishing with a hybrid press can bring legitimacy to an author’s endeavors. This could result in opportunities ranging from participation in book festivals to holding events at independent bookstores to entering books into certain contests, by way of examples. Authors who want a publishing partner that publishes professional books. Now of course authors can find this through service providers or a self-publishing endeavor with the right team, but there’s another higher level of professionalism that’s inherent for hybrid publishers who have traditional distribution because the books have to be high caliber enough that the sales force feels they can sell those books into the traditional marketplace. Authors can be assured they have a partner who’s going to do well by them if they’re working with a reputable hybrid publisher with demonstrable backlist success. Authors who want or need active distribution. Not all authors do. If an author knows that all of their sales are going to be through Amazon, for instance, or if an author has a huge following and is on a speaking circuit that puts them in front of their audiences to sell directly, I would argue these authors don’t need traditional distribution. But there are genres that benefit greatly from traditional distribution (especially fiction and creative nonfiction), and there are authors who really want their books in traditional marketplaces (bookstores, libraries, specialty markets, etc.). Self-published authors can work their tails off to make some inroads into these markets, but the mechanisms in place for presses that have active distribution make this process seamless, which takes a lot of pressure off a published author to figure out fulfillment and distribution, allowing her or him to focus instead on promotion, or on their next writing/publishing venture. JOHN: Thank you for your insights, Brooke. Authors must be extremely careful to dodge the many bad actors out there, and the points you’ve raised will help them to make intelligent choices. BROOKE: Thanks for the opportunity, John. I very much appreciate the work ALLi is doing to educate authors to make those intelligent choices. If you were assured of the quality and trustworthiness of the publisher, would you consider a hybrid publishing contract? Let us know your thoughts in the comments below! I’ve been very happy with my experience publishing with hybrid SparkPress. The editors, designers and other SparkPress professionals I worked with were conscientious about quality and helped me put out a book that is garnering great reviews, including a starred review in School Library Journal! Before going to SparkPress, I spent two years trying to get an agent and/or small press (receiving some nibbles, but no bites). I decided I didn’t want to spend any more time shopping my debut novel. I believed in my work and wanted to get it out there so readers could decide on its merit. The hybrid model appealed to me because it offered a vetted process and a true partnership (authors sign off on cover and interior design, for example). I learned a lot through this guided process, without the headache and trial and error of attempting to do everything myself. Plus, SparkPress offered me a supportive community of writers as well as traditional book distribution — two huge perks. I have no regrets and would do it again. I admit that before I joined Alexa Bigwarfe’s team (Kat Biggie Press and Purple Butterfly Press), I harbored many misconceptions about self-publishing and didn’t even know what a hybrid press was. Over the past two years that I’ve been working with Alexa, I’ve seen the passion and integrity that goes into the work she does with her signed authors. She is truly invested in the success of each book, and author. I’d consider it depending on the cost. But I’d have to be VERY certain of the press. There are so many charlatans out there. I am glad I published with She Writes Press. As a first-time published memoirist, and an older woman with slightly limited energy, SWP was my best option. SWP assisted me to present the best possible version of my story, and got it into the national marketplace. I’ve had stellar reviews from Kirkus and Foreword and many members of the public, and my sales are good. If I do the two additional books I have on tap, there’s no reason I would not do them with SWP.